Lewis Hamilton comes out of the pits but immediately spins as he makes his way through Turn Three, right in front of Sky F1's Martin Brundle during Practice Two. 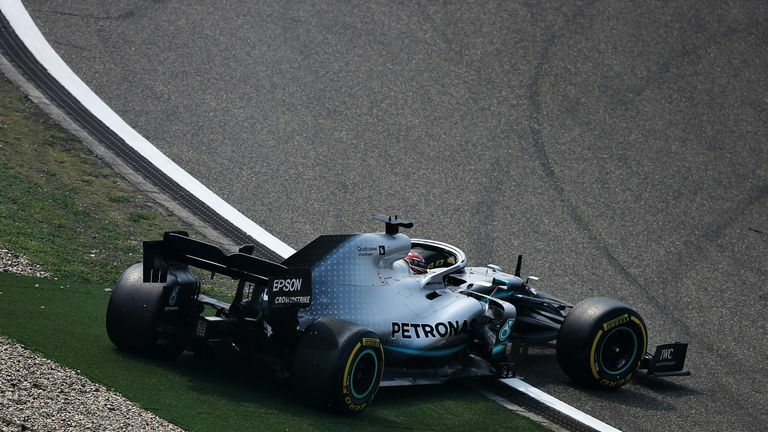 After Mercedes in Australia, and Ferrari in Bahrain, each dominated the other for pace during 2019's opening two races, the first day in Shanghai suggested round three will prove an altogether tougher weekend to predict. Ferrari and Mercedes each topped one session apiece, with the final gap in Practice Two less than a tenth of a second in Valtteri Bottas' favour over Sebastian Vettel. Red Bull, back on form after a set-up miscue in Bahrain, finished just two tenths back to suggest they could also have a say in proceedings, particularly in the race. Hamilton is likely to be in that mix come Sunday himself yet left Friday with ground to make up after trailing team-mate Bottas by 0.7 seconds. "I was struggling with the car today, so we've got work to do, particularly on my side as Valtteri looked much more comfortable in the car," said the world champion, who spun on cold tyres at the start of P2. "We're going to work hard tonight to find some tweaks and hopefully come back stronger tomorrow; the car has the pace in it to compete at the front, we just need to find the right set-up." Provided Hamilton finds the improvements he is looking for ahead of qualifying on Saturday, then he is relishing the prospect of F1 2019 providing its first true multi-team contest at the front. "It is nice to see how close it is between us, Red Bull and Ferrari," added Hamilton. The strength of Ferrari's car in a straight line has been the talk of the sport in the build-up to the Chinese GP. After opening practice, Toto Wolff described it as "frightening", while Red Bull counterpart Christian Horner told Sky F1: "They're ballistically fast on the straights and they are carrying a lot of wing as well. It's down to us to try and catch them. They are the gold standard at the moment and it's impressive even compared to a Mercedes." But Mercedes' cornering strengths on a circuit that features 16 turns of varying speeds means the world champions cannot be counted out. "I expected them to be very strong here so if we can be close to them then that's a good sign," said Vettel. We think Ferrari still have a straight-line speed advantage but the fact that through two thirds of the lap the Mercs are right in that battle, means it's going to be closer than it was two weeks ago. Indeed, both Vettel and Charles Leclerc, who was seventh fastest after a problematic qualifying practice, felt there were also improvements to make to the Ferrari. "Overall happy but I can feel there's a lot more in the car. 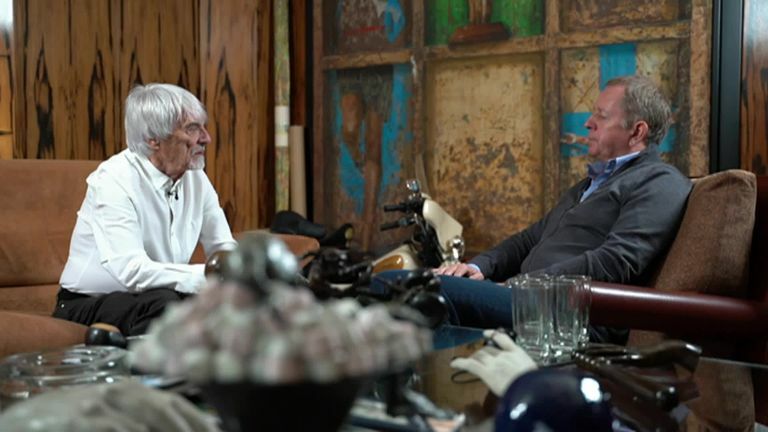 So not entirely happy," Vettel told Sky Sports. "There was also more in myself getting everything together so tomorrow will be key to have a better feeling than today and making sure you striong everything together. Leclerc missed the later race runs as Ferrari checked over a cooling system issue on his car and the youngster said: "Mercedes and also Red Bull are actually quite close so it will be an interesting battle. "We definitely did not expect Red Bull to be so close, but it's s nice surprise." For their part, Red Bull believe they have returned to more recongisable form in China after problems with car balance and tyres in Bahrain. "It looks a lot better than in Bahrain, so very happy with that," said Verstappen, who was third fastest. "We found a problem over there so we naturally expected it to be a lot better today and we had a good balance on the car."